Before I describe how this remedy can assist you I first want to give you a bit more background to this remedy. Reigniting what our ancestors believed health was and how to use traditional ways to heal. The Celts, our Irish ancestors, believed health was crucial; in fact according to the book I am reading there was a fine if your belt no longer fit. The Druids were the guardians of the health of the land and her Celtic people. Health was considered a Mind-Body-Spirit thing and it was a duty of the Druids to oversee that the community remained healthy. The Druids spent years learning their healing ways; immersed in nature, in solitude, allowing nature and her spirits to speak with the wisdom of healing and plant knowledge. Nature, plants, trees, spring water, food, sweat lodges, stones and sacred sites were all considered vital parts of the healing tool kit. Healing wasn’t just a physical and emotional journey; the Druids had an ability to read the person and their soul and gave great importance to assisting you in finding your purpose. All the above resonates so deeply with me, and I use most of the above mentioned strategies in my own healing toolkit these days. This isn’t something that I intentionally set out to study; life brought the lessons to me and nature showed me her ways. Nature has always called me to spend hours observing her, feeling her energies and honouring her wisdom gifted to me. There are many days when I leap out of the bed just knowing that I must cycle somewhere, be somewhere, or to sit in silence on some rock, stone formation or in the belly of a forest quite simply feeling the past and present energies of the land. Through listening with all of my senses I have learnt a tremendous amount of information about the land, her history, her people and the trees and plants; I still have a lot to learn. Although my science brain has given up trying to analyse this magic and I trust in the healing of the plants and their energies I still worry will people and clients think I am daft. Are they ready yet to use this new but very ancient and profound way of healing? Or are they still stuck in their heads, along with medicine and drugs and supplements that are failing to heal us ( because mostly the true causes aren’t where we place blame). Meanwhile sciences uses an ever more powerful microscope to look at the body in increasingly minute and isolated ways; we are starting to very obviously miss the bigger picture. I have had to very much change my own attitude about the energy of healing and the subtle energies of the plants, herbs, stones, and aromatherapy oils; even light, sound and vibration carries healing information. As I allowed myself to get over my attachment to my science training as a pharmacist and nutritional therapist I started to see that there is so much more. Furthermore opening myself up to seeing out of the box has allowed me to explore myself and my sensitivity to this world. I have written about this in greater detail in another blog (here) for the intention of helping many others with similar sensitivities that are challenged by coping in our modern world. I don’t have all the answers (yet) about are people ready to make changes when I suggest they get into nature, listen to their soul whispers, and trial the remedies that I make from trees and plants……. But I will continue to honour the nudges I receive and will add to the wonderful range of healing plant and tree essences that I have in my clinic waiting for those ready to embrace their wonders. Watch children… they will collect plants, tree parts, climb in trees, collect stones, and jump into water…. children know best because they haven’t forgotten. And many also know how to release the emotions before they cause illness. Mind – We are living almost completely in our minds; forgetting the intelligence and intuition of the heart. Body – We are all over the shop in relation to diet and exercise . Our bodies need a better balance, a ‘whole’ approach and for us to start honouring and listening to her calls. We are increasing reliant on drugs, supplements, and extreme diets far removed from locally sourced and sustainably produced foods. We are also becoming obsessive and unhappy in unsustainable exercise routines; exercise should be fun and play. Spirit – And most importantly, we have lost touch and forgotten about spirit. Our spirit is the us inside, and connects us to the web of energies all around us in this world and perhaps farther. This loss of connection is why I believe so many people feel lost; and why I believe so strongly in these healing plant and tree remedies. So today I was back on my bicycle called to this spot (shown in the photo) located half way up Keeper Hill, where the sun was breaking through the clouds onto this baby beech surrounded by heather, wild blueberries and on closer inspection blossoming gorse (rare for this time of year) and three white and rose quartz crystals bedded into the ground (I think you can see some of them peeking out of the earth in the photo). It is here that I sat in quiet meditation and collected my plants to create this remedy I am calling Mothers Love: heather, gorse, beech, and white and rose quartz. Each plant is significant in its own right; the heather I have written about here; Heather is also my mums name! The beech is the mother tree (as oak is the father) and finally gorse holds a lot of meaning for me above what the plant itself does representing a great connection to the energy of my grandmother (she used to use gorse flowers as a hair rinse). This is the first remedy that I have used stones to energise, having added the vibrations from the white and rose quartz found beside these plants. This is Mothers Love: the love and guidance from our mothers, their mothers and their mother’s mothers. Generations of wisdom, strength, and persistence. Generations of caring, generations of having a voice and purpose and healing path (for the women of our Celtic ancestral line were granted equal rights to men). These are the women who were powerful and important healers in the community. Mothers love helps provide an energy space for you to heal your heart wounds. Wounds of fear, insignificance, and any residual or subconscious anger over feeling hidden in the background and a perception of being invisible. Mothers love allows us to feel comfortable in our skins with no need for attention. Our path is indeed in the silent hidden tracks but is very much awarded and acknowledged by the spirit world. Take Mothers love to heal your heart, the scars of your wounds and open your vision, intuition and all senses such that you find your path and have the self confidence to take the first steps. 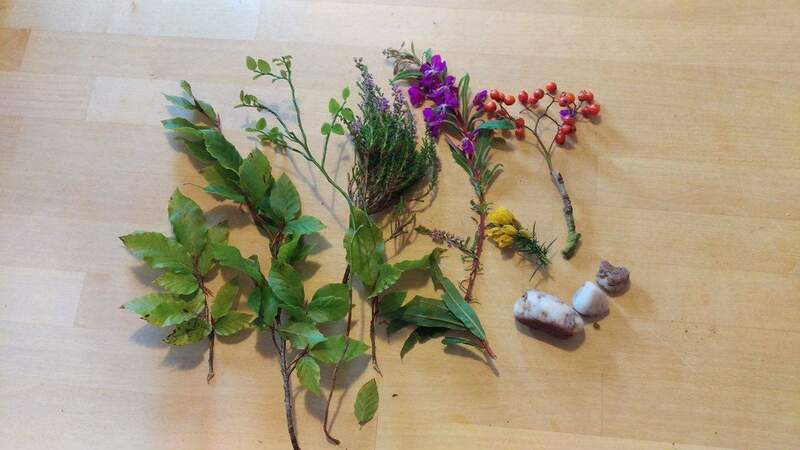 There are a few additional herbs and plants in my gatherings here: beech, wild blueberries, common heather, to be identified purple hedgerow flower, gorse, mountain rowan berries and quartz.